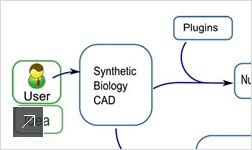 In the IDEA Studio, University of Washington PhD candidate Deepak Chandran initiated development of a Maya plug-in for 3D simulation of synthetic biology experiments. Chandran created a Maya plug-in, using Nucleus framework, to serve as an approach to multi-cell modeling for synthetic biologists. 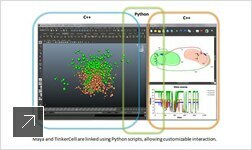 The plug-in, called nTinker, attempts to synthesize his current CAD tool TinkerCell with Maya in order to mimic and visualize cell population growth. 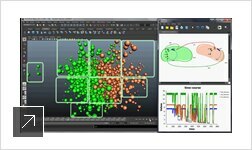 Maya’s physics engine enables users to investigate key physical aspects of cell growth such as physical stress and size changes. 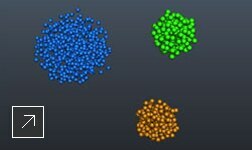 These physical properties influence the internal dynamics of individual cells which are simulated in TinkerCell. 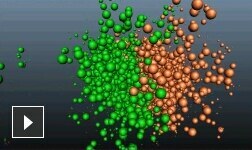 The following video shows nTinker integrating TinkerCell simulation with Maya animation—combining physics and internal dynamics to simulate a colony as a whole. In the quest to understand more about bacterial colony growth, biologists are tasked with testing multiple hypotheses. 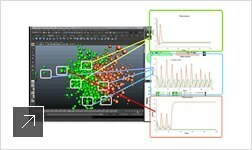 To meet this objective, the plug-in allows researchers to customize simulation details using Python scripting. 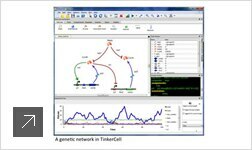 Linking Maya and TinkerCell, the plug-in provides flexibility for investigating and explaining experimental observations.